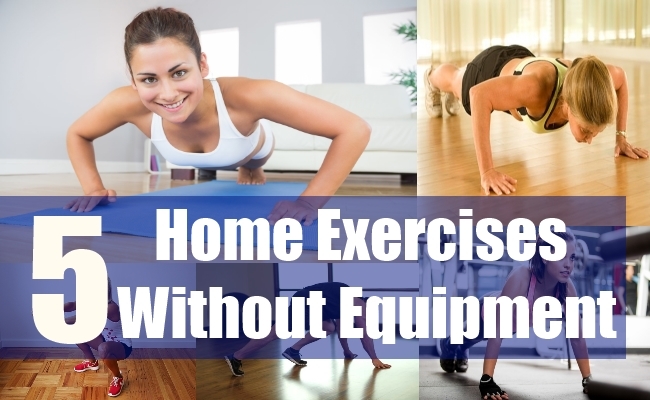 Many people say that they don’t have time to go to gym or don’t have access to any weight lifting equipment. Well if are one, then it’s time to change your thoughts because this article will provide you with good exercises that you can do at home without using any weights and they require less space to do. What you are going to use is your own body weight and results are quite appreciable if you do them regular, they not only improve your health but also your metabolism. So without going to gym, you can literally build good body that will grab others attention. Push ups by all means is the best exercise for building chest and triceps by using your own body weight. Push ups can be done at any time and anywhere. There are many variations in push ups that you can do once you perfectly do normal push ups. Lie on the floor and place you arms at shoulder’s width on the floor with your feet supporting the body. You are in position now, start the exercise by lowering yourselfs down until your chest touches the floor and then come back again. Do about 20 reps in 2 sets. Mountain Climbers are best exercise to burn abdominal fat and it’s also a good cardiovascular exercise. Mountain climbers can be done in combination with push ups to make it more challenging. The form of mountain climbers is same as push ups. So take Push up position on the floor. Using your legs push one knees front close to elbow like you are kicking and then immediately pull the knees back and push the other knees front. The movement is important, so first get the correct movement and repeat it for 20 times in 3 sets. Burpees are tough and good exercise for overall body. It is good exercise for strength training and also in aerobics. Burpees just like push ups doesn’t require much space but good stamina is required to do more repetitions. The position of burpees is simple, first stand on the floor and take squat position with your hands on ground. From squat position extend you legs back and next quickly take again squat position. Now using that position, jump up as high as possible. Do about 20 reps in 2 sets. Squats is one the best known exercise that is most popular among weight trainers. Squat can be down without using any kind of weight like barbells, you will be again using your own body weight. Squats target different muscle groups in lower body and that’s the reason that makes squats an important exercise. Stand straight on the floor with your hands facing front at your shoulder’s level. Now slowly bend down using your hips and as you come down bend you knees. Again as you go up, use your hips and knees to come back to standing position. Do about 20 repetitions in 3 sets. It’s a great warmup exercise that you can do before starting your workout. You can end your workout by doing crunches at the last. Crunches exercises your abdominal muscles and one of the best exercise to get six pack abs. Lie flat on the floor and bend your knees a bit. Place your hand at back of your head and push your upper body toward the knees. While you come front contract your abs and wait a second at that moment. Then come back to starting position. Do about 22 repetitions in 3 sets.